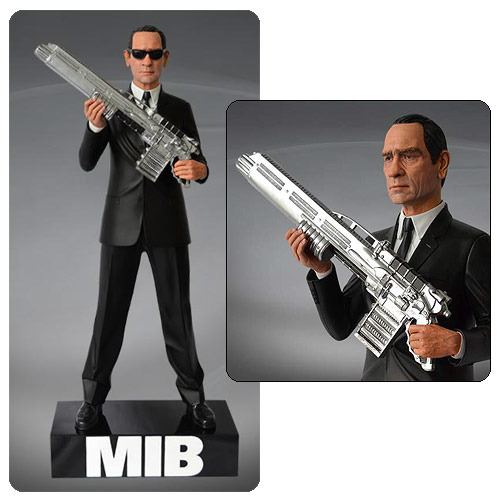 Featuring an authentic likeness of Tommy Lee Jones in character as Agent K, the statue can be displayed either with or without the classic MIB sunglasses - essential if you are going to use the neuralyzer! Agent K is portrayed standing ready to guard the Earth from Alien invaders with his trusty Pulsar Blaster! Standing 20" tall, the statue comes complete with an MIB themed base. This awesome piece is constructed from heavyweight polystone and then hand painted to the finest detail. A must have for all MIB fans! The matching Agent J statue is also available to complete the iconic scene (sold seperately).